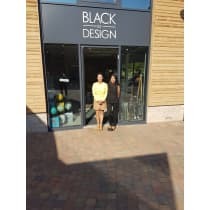 Founded by Steve and Lynette Pym, Black By Design in Willington is a design-led homewares boutique. Prior to opening their physical store, Steve and Lynette traded online for seven years, honing their industry expertise and refining their product selection. The pair decided that a bricks-and-mortar space where customers could see and feel their range in person was the next logical step, and so set up shop by Willington's picturesque inland marina. "We are confident that there is a bright future for the smaller independent, particularly when they are based in locations outside of town centres where customers can both shop and spend time enjoying other activities." Umbra Chrome Prisma Photo Frame 4" x 4"
Umbra Chrome Prisma Photo Frame 4" x 6"